This week Dina and Hettie from the Eden project visited us to collect their order for orchids for the new display in the Rainforest Biome. We are really excited to be working together to design Eden’s first major orchid feature to take the prime spot just inside the Rainforest Biome. 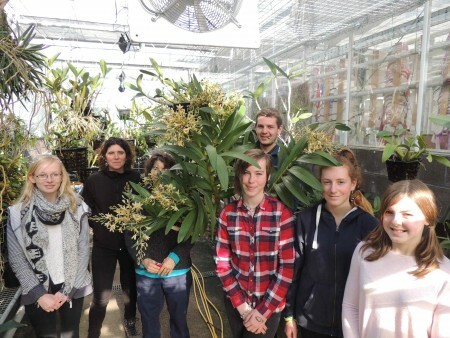 The exhibit will feature more than eighty charismatic orchid species all grown by Writhlington Students and will include information about the plants, their habitats and our work to support education and conservation. The team are pictured here under our amazing plant of Ansellia africana. This plant was raised from seed in the Writhlington laboratory in 2004 and sold as a seedling kit at Eden in 2006. Last year its Cornish owners asked if they could donate it back to the school as it had grown too large for their flat! Next month it will be a feature plant for our display at the RHS london Orchid show (1st and 2nd April RHS Halls, Westminster). As well as the new orchid display we are working with Eden to explore the impact electronic innovation by Mendip students can have on the visitor experience to the biomes.